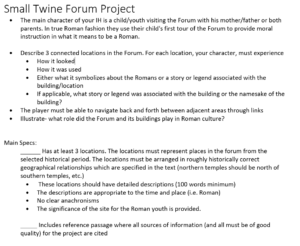 This is the second in a series of posts intended to get readers thinking more about interactive text as a tool for history education and how students might be enabled to design their own researched, text-based historical simulation games using the interactive fiction design tool, Twine. Last week’s post discussed the differences between Twine and Inform. This week’s teacher diary walks through the steps I have taken so far to design and implement a long term Twine interactive history project. The class is a high school senior elective on the Roman Republic. The first step was to get the students comfortable with the idea of a Twine interactive history text. I call it that because “interactive fiction” obscures an important point. Their Twine projects, while inherently counterfactual (either because the character is fictional or, with historical characters, one can choose different actions and, in doing so, presumably reach different outcomes) must be historically authentic. In other words, students must be able to document that the scenarios they have created and the details they have included are based on solid historical evidence. 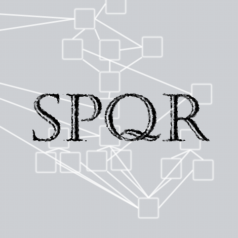 Gain familiarity with an ancient source and some sound secondary sources on a particular topic in Roman history. Reconstruct aspects of the past in ways that are imaginative but very well supported by the evidence and with few anachronisms. Hone their skills at narrative and descriptive writing. 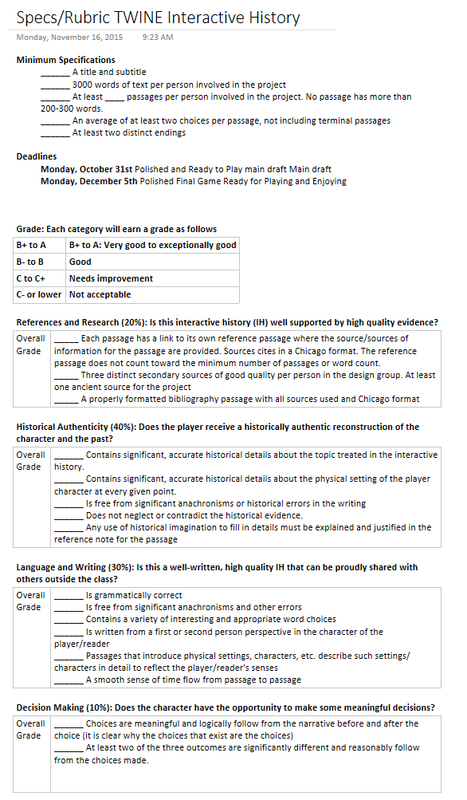 I then provided a series of topic options for students, but noted they could choose something not on the list so long as they met the big picture goals and were able to satisfactorily research and reconstruct a historical interactive text on the subject matter. These were some of the options, essentially just a list I had kept since the last run of the Twine project. Hortensia makes a speech against the triumvirs where, through choices, the elements of the speech change. I also included some general historical settings that could be the context for a Twine historical text. 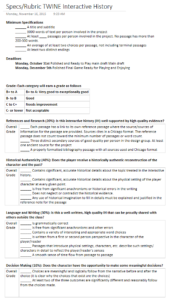 After offering this big picture overview, I provided students with this rubric for the project. It’s still in draft form and will need revision according to how things work out in this run of the project, but serves to emphasize the important areas of focus for the project. The research essays were due a at the end of last week, so I have not had a chance to grade them yet. 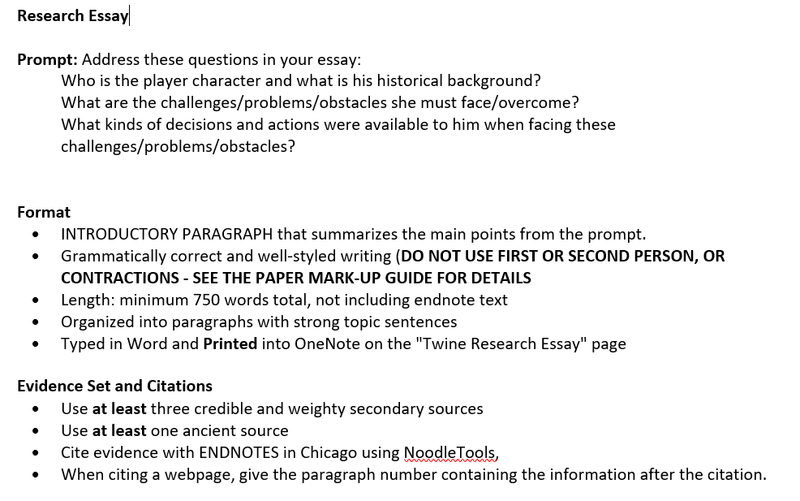 Since writing the essays has required students to clarify and develop their ideas for a good Twine project, I can list the topics that students have selected. One group wanted to do something involving wandering the streets of Rome and looking at the different sites of the Forum. We talked about the main character, what possible historical character/figure might do this walk, and whether there was enough good evidence to flesh out that character. I suggested that perhaps they might want to make the character a Roman aedile, a minor magistrate that was responsible for maintaining the public works and temples of the city. Another group opted to work on Cicero and the Second Philippic. At this point it is not yet clear whether they will simply have the character be Cicero and make choices in his speech against Marcus Antonius, a counterfactual speech of sorts, or whether the character will engage in a series of conflicts with Antonius. Battle reconstructions were the most popular in this small group. There are advantages to a battle simulation. First there is a great deal of evidence and scholarship on the Roman army in the Republic (it probably doesn’t hurt for these students either, that that is my specialty in history). Second, battles are concrete and can pretty readily be conceptualized as a series of meaningful choices that influence the outcome. One group chose the Battle of Cannae, one the Battle of Vesuvius, and one the Battle of Sentinum. The last group chose to represent an aristocrat’s choices as he climbed the political ladder of the Republic, the cursus honorum. Since I have chosen to work on a similar project for my own Twine, I’ll be very curious to see how their project develops. Finally, two students chose to work on their projects solo. 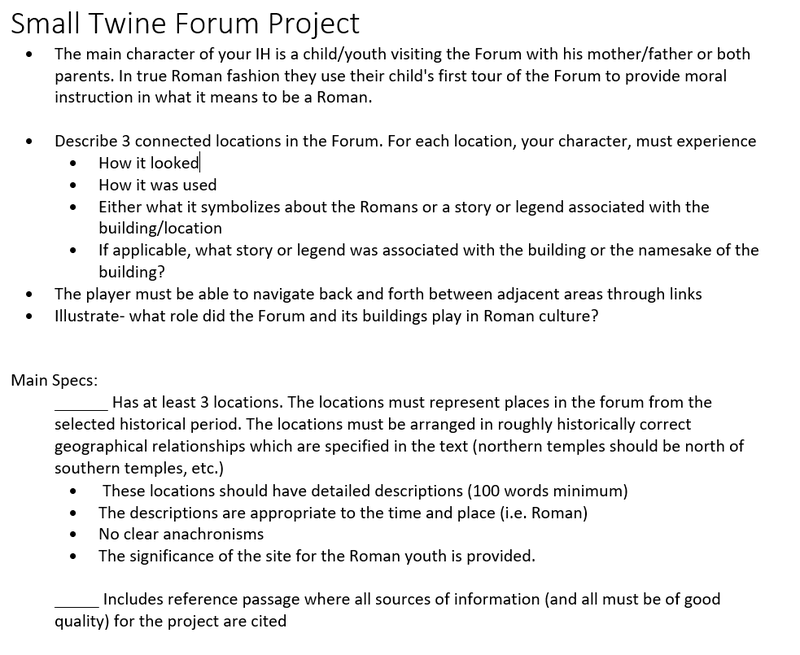 One is interested in architecture and so is exploring the idea of a Twine based around Augustus’ restoration of Rome. The other wants their character to be a senator in the political conflicts and shifting alliances in the aftermath of Julius Caesar’s murder. What excites me most about a historical simulation design project is the many opportunities it provides/times it requires students to really think about what they do and do not have evidence for and what are and are not reasonable assumptions based on that evidence. In a Twine project of this type, there is quite a deal of context required and that context, according to the specifications of the project, must be historically defensible. This leads to great educational conversations. So, for example, I talked with some students and investigated the extent to which their understanding of the social mobility of their Roman character was based on assumptions as a modern American that might not be valid for the Romans. I also discussed when there is no explicit evidence suggesting that a historical character did x, whether it was defensible to infer from evidence for similar figures in similar situations. And then there are the number of specific and fascinating historical questions students raise that it is hard to imagine them doing in the normal course of the class. Next week, I’ll post a Developer report on Path of Honor, the Twine I am developing. If you do have questions about the students projects and how they are progressing, leave a comment and I’ll respond.